Tonight, the $30,000-to-win show concludes. Fairbury Speedway, the 1/4-mile bullring will host the World of Outlaws Late Model Series and the DIRTcar Modifieds. View full 2018 Prairie Dirt Classic results below. Dennis Erb Jr and Gordy Gundaker will lead them to the line in B Main number one. Green, Erb heads to the bottom. Gundaker pounds the cushion and then the gas pedal. Gundaker leads off turn 2. Lap 2, Moos and Toland tangle for 5th as they fought for the bottom lane. They spin, the caution is out. Green, Gundaker leads, Erb runs 2nd. Pierce runs 5th, he started deep in the field. Slide job, Pierce to 4th. Weisser to the bottom, Pierce clicks by on the outside, move him to 3rd. 7 to go, Pierce is all over Erb for the final transfer spot. Pierce slides him, Erb crosses him. They race through lap traffic. 2 to go, Pierce throws the slider in turn 1, not clear, he lifts. 1 to go, Pierce tags the wall off turn 2. Turn 3, Pierce is sideways, Duty gets into the back of him as he was already going around. Gordy Gundaker wins B Main #1! Jimmy Owens and Billy Moyer will lead them to the flag stand. Green, Moyer to the top in turn 1. Owens runs the middle. They run side by side off turn 2, Moyer leads into turn 3. Lap 2, caution for debris. Green, Larson takes 2nd due to his lane choice on the bottom, caution. Green, Owens picks the bottom, he holds 2nd this time, caution. Green, Owens pulls to Moyer’s number into turn 1. He leaves room at the top for the #21, Feger fills the hole. Feger to 2nd on the outside. Caution, Spencer is stopped against the outside wall. Green, Owens slides Feger in turn 1. Feger crosses him, Owens holds the spot in turn 3. Spin at the back, caution. Green, caution. Green, Moyer hits the cushion, Owens follows. Feger is under fire from Larson for 3rd. 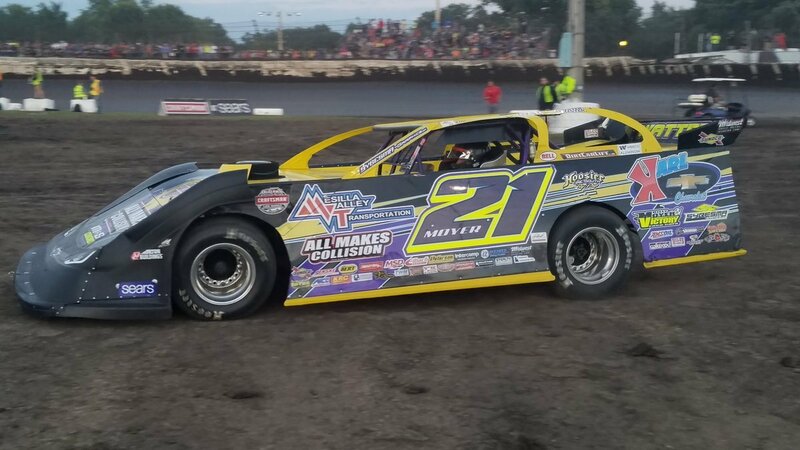 Billy Moyer wins B Main #2 at Fairbury Speedway! Tyler Erb and Bob Gardner will lead them to the start of B Main number three. Green, Tyler Erb launches. Caution, false start. Erb is sent to row two. Hudson O’Neal and Bob Gardner lead them to the start. Green, Hudson O’Neal leads into turn 1. Tyler Erb fights back to 2nd. Hudson O’Neal slides the lap car of Rodgers. Rodgers doesn’t lift, he drives into the fuel cell of the leader. Hudson O’Neal has a flat right rear! The caution is out. Green, Tyler Erb leads. Jameson knocks on the outside wall. Bob Gardner runs the bottom, side by side for the final transfer position. Jameson noses ahead. Junghans is around Gardner for 3rd. Tyler Erb wins B Main number three! Bobby Pierce stated toward the tail of the non qualifiers event. He went to the top and drove to the front knocking the rear spoiler off on the wall along the way. With 2 to go, Pierce pulled to the rear bumper of Feger for the lead. The caution flag dropped as there was a spin on the track. Green, 2 to go, Pierce pulls to the rear bumper of Feger out of turn 2 as Feger knocks violently on the cushion. He looks to the inside of Feger for the slider in turn 3, Pierce leads at the line as the crowd erupts. 1 to go, Pierce cruises and opens a gap to Feger. 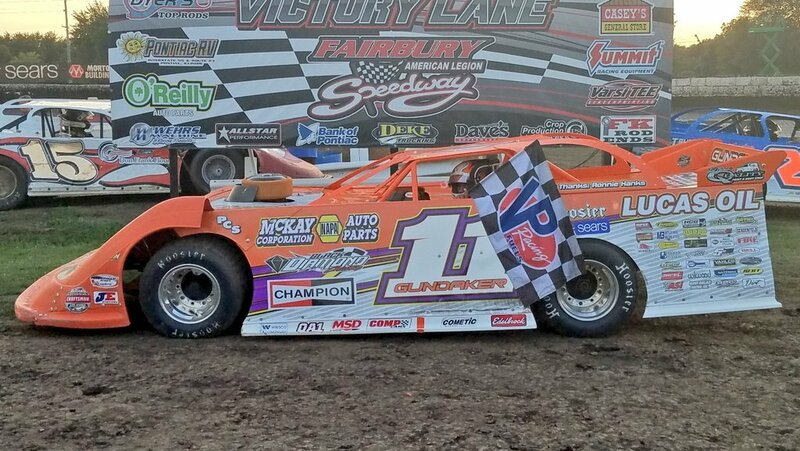 Pierce wins the Shootout at Fairbury Speedway! He elects to give up the $2,000 to start at the tail of the main event. Green flag, Simpson leads by a car lengths into turn 1. Jason Jameson is slow on track, caution. Green, same thing, Simpson by a car length into turn 1. He jumps to the cushion and Sheppard follows. Lap 10, Sheppard is looking for the lead on the bottom. Lap cars run side by side just ahead. Babb closes in on both of them. Simpson and Babb run nose to tail around the top. Sheppard is on the bottom. Lap 14, Sheppard moves to the top. Babb cuts to the bottom. The reform single file around the top. Lap 19, Sheppard is nearly clear in turn 4, he leaves room for Simpson on the top. Sheppard completes the pose with a slider in turn 1. Sheppard takes the lead. Lap 25, Simpson is dropping quickly. Madden and Moran split him. Babb is around him as well. Davenport started 16th, he runs 9th. Pierce started 27th, he runs 22nd. Lap 31, David Breazeale is slow. He parks at the top of the race track and the caution is back out. Flat right rear for Breazeale. Green, Sheppard leads into turn 1. Moran and Madden cross off turn 2. Madden holds 2nd. He’s looking for the lead on the bottom. Caution! Pierce and Larson are tangled on the track. Green, Sheppard leads. Moran pinches Madden off turn 4 and coming to the line. Moran takes 2nd into turn 1. Lap 36, Eckert and Clanton are hooked together. Eckert has a flat tire. The caution is out. Green, Sheppard leads into turn 1, Moran follows. Unzicker is sideways in turn 3, he saves it as they run 3 wide passed him. Lap 40, Moran is looking for the lead. Moran looks to the bottom. Sheppard remains on the top. They run side by side, Moran noses ahead at the line. New leader, Devin Moran. Lap 49, Tanner English is around, the caution is back out. Jonathan Davenport heads for the infield, new rear tires are going on. Green, Moran leads. Madden is back to 2nd. Bronson is aggressively working his way into the top 5. The #40B is running right through the ruts in cushion off turn 2. 42 to go, Eckert is slow, caution. Davenport and Simpson hit the pit lane for new rubber. Eckert is pulling off the helmet. Green, Kloos stacks up the field, caution. Owens and Larson tangle in turn 4. Don O’Neal is in for two new rear tires. Green, Moran leads on the bottom. Madden runs the middle and Sheppard runs the top. Bronson runs the wall in 7th. Sheppard has found speed on the cushion. He’s running down Madden, the #44 shuts the door off the corner. Sheppard kicks it to the high side again, he’s at his door this time. Sheppard takes 2nd on the outside. Bronson is broken at the track exit, the caution is back out. Green, Moran launches. He comes down the hill, the nose of Madden was already there. Moran is sideways in front of the field. Madden lifts, Moran gathers it back up. Moran leads into turn 1. Shirley to 3rd. Kloos is sideways in the middle of the track after Tyler Erb got into him. Don O’Neal comes into the scene with nowhere to go. O’Neal puts it sideways, he slams him hard. The impact lifts the car off the ground. On the infield, crew members talk out what just happened. Green, Moran leads on the bottom. Sheppard is coming quick around the top. 31 to go, Sheppard pulls alongside off turn 4, caution. Brent Larson is around. Green, Moran leads. Sheppard hits the cushion, he bounces violently off turn 2 with his foot in the throttle. 29 to go, Sheppard looks to the outside of Moran. In turn 1, Sheppard catches the cushion early and rides it all the way through the corner. In turn 3, Sheppard hits the cushion early then cuts down the hill, he’s running the diamond in 3-4. 23 to go, they still run side by side. Sheppard noses ahead. 21 to go, they race through lap traffic. Moran moves to the top to work around the lap cars. Moran opens up a gap of 4 car lengths. 10 to go, Moran leads Sheppard by 2.5 seconds. Sheppard used up the Hoosiers running the cushion. 5 to go, Sheppard has closed the gap to 1.8 seconds at Moran works the lap car of Davenport. It’s short lived, Mike Marlar is around Sheppard on the bottom, he started 15th. 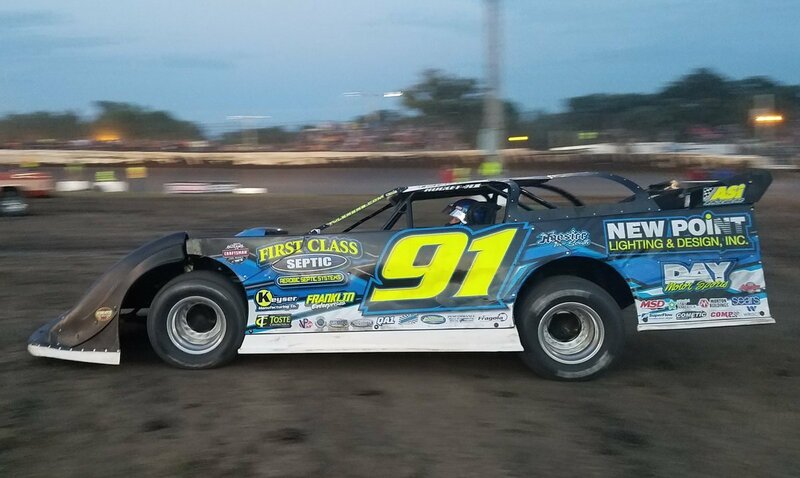 Devin Moran wins the 2018 Prairie Dirt Classic at Fairbury Speedway! It’s the biggest win of his career. 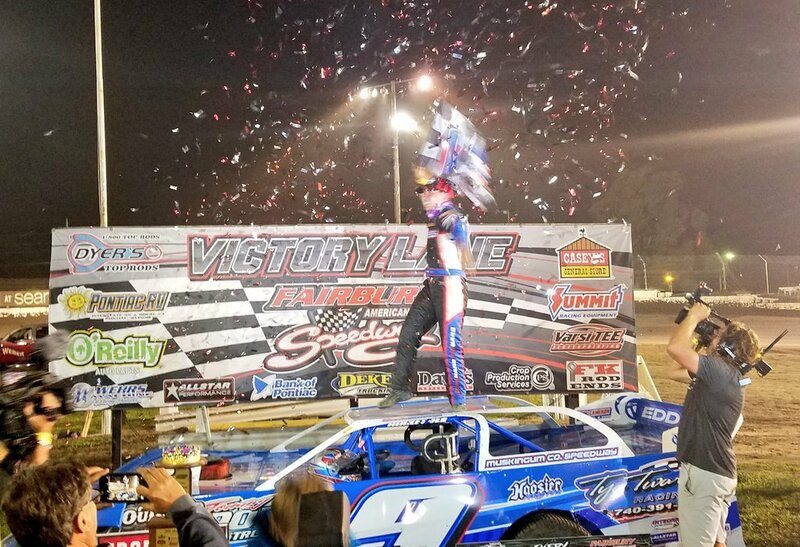 View full 2018 Fairbury Speedway results below. View full Prairie Dirt Classic results for the Dirt Late Model class below. 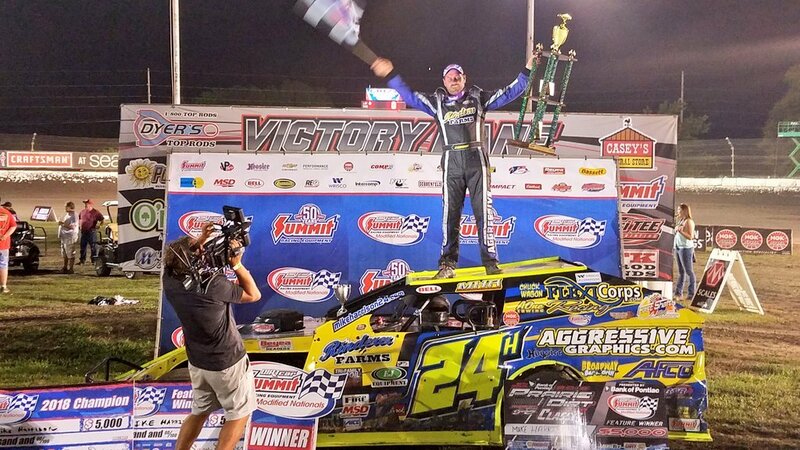 View full dirt modified results from Fairbury Speedway below.